A new roof is a major investment, but after a storm homeowners often just want to get back in their home quickly! It can be easy to just go with the first roofing contractor that shows up on your doorstep, but using a reliable and local trusted contractor will prove to be beneficial long term. 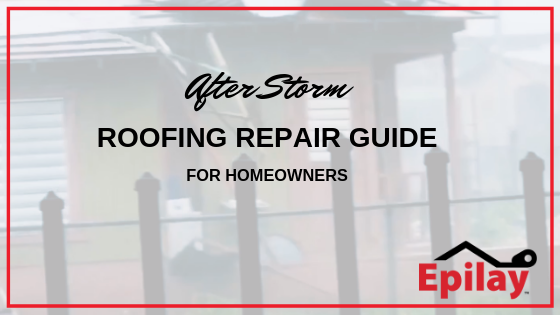 Use our after the storm roofing repair infographic to help find a trustworthy contractor after you experience wind, rain or hurricane damage. Filled with advice on how to choose a roofing contractor to determining if they did a nice job, this infographic is a handy guide for any homeowner replacing a storm damaged roof. Epilay synthetic roofing underlayment is a smart choice to use after storm damage. Epilay underlayment is water resistant and provides an excellent seal around fasteners, which means that should your roof be damaged in a future storm, the underlayment will help provide an extra layer of protection until repairs can be made. More a watcher than a reader? Scroll to below to watch our video!